If you are plugged into the online world of marketing as of late there has been a major buzz surrounding a new product on traffic strategies. The product is called Traffic Dashboard and its creator is none other than Kim Roach. OK. You might be making that “I Don’t Know Who This Chick Is Face” so if you haven’t heard of her your about be schooled. Kim is a 25 year old marketing maven who specializes in Ninja traffic strategies. She has a blog called BuzzBloger.com where she offers off the chart valuable training and tutorials that any marketing dummy can grasp. She’s been featured as a guest blogger on several high profile blogging sites such as Problogger.com and Lifehack.org. Kim is a meticulous marketer and her tracking techniques prove it. She has traffic coming to her blog and websites from more than 500 plus sources. Her reign as Traffic Queen is not just a cute nickname. This woman knows traffic inside and out. With Kim’s busy schedule she somehow made the time to create Traffic Dashboard. It offers over 8 hours of traffic strategies with not only a video tutorial of each strategy but with a complementary PDF to make understanding it much easier. Here simple step by step teaching approach makes it virtually impossible not to understand the world of traffic and lead generation better. The best part about Traffic Dashboard is that these are truly one of a kind strategies. You’re not going to find these unique techniques and tips from any other fly by night source. Kim has taken her time to test these strategies and shares with you cases studies as proof that they work. Another great feature that Kim offers is that she invites you into her laboratory of genius. She allows you to look over her should and see how she created the Traffic Dashboard and gives you insight on how you can create your own product. With Kim everything is of high quality and she takes you into her creative thinking process. Speaking of High Quality, that is a major theme with Kim. She emphasizes that all the content rich articles, videos, blog post, etc. must be at the Next Level in order to be effective. It doesn’t have to be a thesis but it does have to be value packed for the reader. The school of thought on this is two things 1. You show readers that you can help them solve their problems 2. And because of that you are seen as an expert and a leader. To uphold your reputation you must consistently deliver your best. 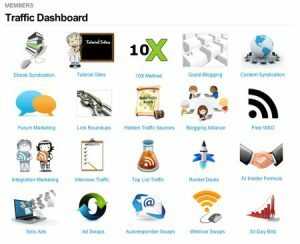 After months and months of marketing online I have never come across a product like Traffic Dashboard. Kim and her Business Partner Tim Atkinson launched the product through a series of 4 value packed videos. Each video offered more traffic strategies then the one before giving everyone a very accurate depiction of what the Traffic Dashboard had to offer. Kim over-delivers for the measly $39 dollars it cost to get Traffic Dashboard. Because it can help you gain a competitive edge over your competition it is easily worth over $1997. But Kim not only practically gave away her prized possession strategies at a ridiculous price but she also included an affiliate program that offers 100% commissions. YES, you read this right. If you purchase the product and become an affiliate you make $39 paid directly into your bank account via PayPal. This is another insane Ninja move by Kim. She understands that if she keeps her affiliates happy with a phenomenal product that they will become trusted business partners with her tomorrow. Traffic Dashboard is not for everyone. If you don’t care about putting out great content and learning the various ways on how to syndicate it then you might as well check out now. Traffic Dashboard will be a waste of your time. Its only for serious business professionals who want to add 100 plus leads to their list a month and are serious about learning how to do that and taking the action steps needed to make it happen. So just to be crystal clear that purchasing Traffic Dashboard alone will not get you the traffic you want. This product is not a lot of hype or fluff. No motivational or inspirational chants will be found here. Kim will shows you exactly what works with her straight forward strategies. If you take action on the strategies then you can plan on not recognizing your business in a matter of weeks. Get Your Hands On TRAFFIC DASHBOARD Today & Start Making 100% Commissions. Aleya Helmy, one of your Social Diva’s group. Thumbs up for such a wonderful content. I agree 100% to every word you said about Kim Roach. I am a great fan of her, and have already bought the Traffic DashBoard myself. Bravo! I am sure that Kim will love you for making such an awesome post.